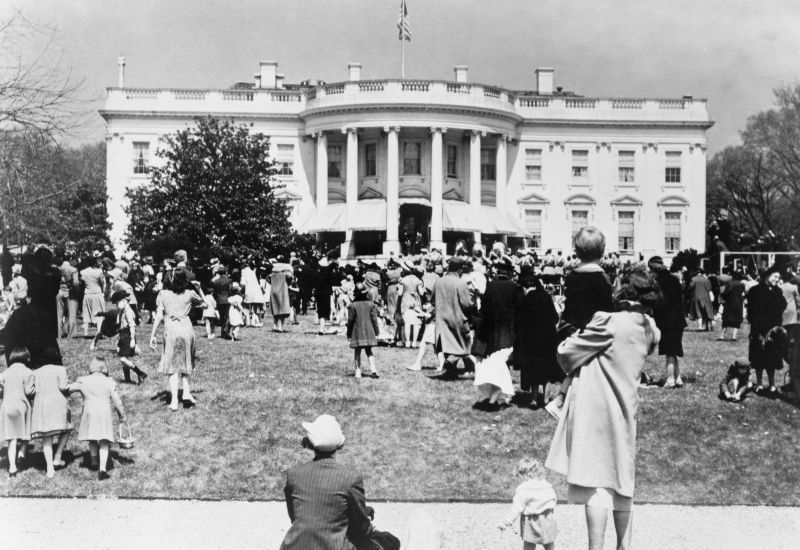 The public attends the Annual Easter Egg Roll on the White House grounds in 1954. The Easter Egg Roll is an annual event, that is held on the White House lawn each Easter Monday for children and their parents. I’ve put together a list of little know historical facts about the Annual White House Easter Egg Roll. And to add some visual flava, there’s a slide show chronicling the party through history…Enjoy! The Easter Egg Roll is a White House tradition dating back to 1878 and President Rutherford B. Hayes, but there are records of informal egg rolling events even earlier. Dolley Madison, the wife of President James Madison, held a event in 1814 and hundreds of children brought their decorated eggs to join in games. The White House Easter egg roll was originally in front of Capitol Hill. That site was closed off after President Ulysses S. Grant signed a bill in 1876 banning egg-rolling because it caused too much wear and tear to the lawns. The law was so strictly enforced that the Capitol Police had to eject some die-hard rollers. Grover Cleveland was the first President to join the egg roll. In 1885 a group of kids demanded a personal audience with the president after walking into the East Room of the White House (security clearly wasn’t as tight then). After that, the rollers weren’t allowed indoors. Music was added to the party in 1889. The United States Marine Band, conducted by John Philip Sousa, was asked to play for the children. Sousa’s “Easter Monday on the White House Lawn” was composed in honor of the tradition. The Jonas Brothers, a favorite band of First Daughters Malia and Sasha Obama, played for the rollers in 2008. The White House instituted a one adult per child rule in the 1930s. The crowd got so sneaky about circumventing the rule that the Secret Service had to regulate at the gates. Crafty children would even charge adults to come in with them. President Nixon and First Lady Pat Nixon were the first to include the White House Easter Bunny in the festivities. A member of Mrs. Nixon’s staff dressed up as the first human-sized bunny. Since then, life-sized bunnies and other animals have strolled the White House lawns during the event. In 2009, the Obamas chose a green egg as their souvenir. In the spirit of a greener White House, kids got an egg designed to be “the greenest egg in White House Easter Egg Roll History” that year.